Hainburg, Germany—October 2017—Pharma Test Apparatebau AG, a leader in the field of high-value testing equipment for the pharmaceutical industry, announced its new line of automated online tablet dissolution systems today. The ADS Automated Dissolution Systems are composed of a Pharma Test PTWS tablet dissolution bath, a peristaltic pump, and TIDAS L diode array UV/VIS spectrometer including a multi-cell changer made by our sister company, J&M Analytik AG. In these systems, the medium is pumped in a closed loop through cuvettes in the cell changer of the diode array spectrometer. Pharma Test offers dissolution baths from 8 to 12 stirred positions. Each instrument is equipped with either a manual or an automated tablet drop magazine, an automated sampling manifold, which moves into the media at the programmed sampling intervals, and individual temperature probes, which log the media temperatures at each sampling cycle. The new TIDAS L line of laboratory diode array spectrometers by J&M is ideally suited for integration into an online dissolution system. It is equipped with a multi-cell changer for up to 8 or 14 flow-through cuvettes, depending on the number of test stations of the selected dissolution bath. The peristaltic pump is placed on top of the spectrometer to keep the total bench space requirement of the system at a minimum. The TIDAS L features an integrated PC with a large, highresolution touch screen running the powerful WinDiss ARGUS dissolution software package. The software controls the spectrometers, the dissolution bath, and the pump, meaning this system is fully integrated and can be setup and incorporated into your lab quickly and seamlessly. The system can be run stand-alone or be connected to your network to share the results in your organization. The diode array technology gives you rapid results over the full spectrum with each scan. No moving parts in the light path means excellent reproducibility of the results and low maintenance requirements. 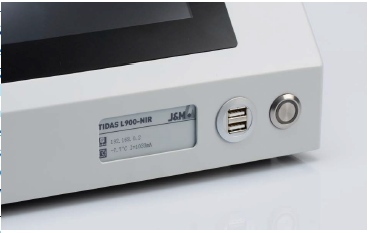 The TIDAS L spectrometer features an additional E-ink display to show data like your lab asset or inventory number, the date of last calibration, and the due date of the next calibration. Due to the unique nature of the E-ink displays, this information remains visible even when the instrument is turned off. WinDiss ARGUS is a revolutionary scientific dissolution data management software tool for instrument control and advanced data acquisition, management, processing, and reporting - designed by users for users. Intuitive wizards help anyone in your lab work better - your next dissolution test is running in just a few clicks. WinDiss ARGUS also features the option to perform multi component analysis for which the full spectra gathered by the diode array spectrometer provide the ideal basis. For a limited time only, we are offering the 21 CFR Part 11 document management and manual free of charge for all online or offline dissolution automation WinDiss ARGUS software packages. The new ADS online dissolution systems including the new TIDAS L diode array UV/VIS spectrometer are available for order now. Contact us or your local Pharma Test distributor for more information. Any pharmaceutical production facility requires routine testing of physical dosage form properties as well as active pharmaceutical ingredient (API) content. Since 1979, Pharma Test has been synonymous with the development and production of high-quality test devices and systems for the quality control of tablets, capsules, suppositories, ampoules, bulk materials, and other solid dosage formats. We offer a complete product range from manual, physical testing instruments to fully automated, analytical test systems to analyze the active chemical composition of a dosage form as well as its release rate. Our foremost priority is to develop products with the quality and longevity you would expect from the “Made in Germany” label—“The German Gründlichkeit.” To learn more, visit the Pharma Test website at www.pharma-test.com. J&M Analyik AG is a pioneer in the field of fiber-optic measuring systems in the area of UV/VIS and NIR spectroscopy. Since its foundation in 1987, J&M has offered innovative solutions and analytical systems for both laboratory and process analytics. The TIDAS® series of spectrometers are used with suitable accessories such as tailored measuring cells and fiber-optic probes in the chemical, pharmaceutical and food industry. Typical applications are the monitoring of cleaning, drying, and mixing processes as well as the determination of concentration of ingredients like fat and protein content in milk. Innovative products are constantly developed by working closely with both customers and partners. 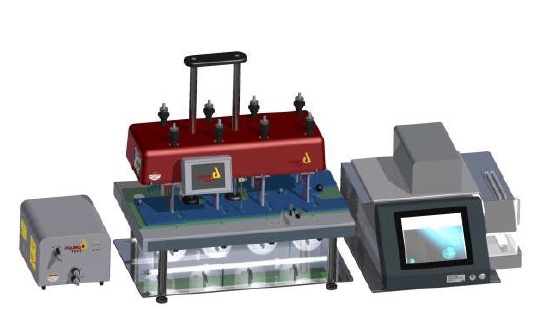 New developments in the area of networked, miniaturized fiber-optic probes based on LED technology will further advance the integration of spectroscopic analytics in the mass market. To learn more, visit the J&M website at www.j-m.de.